12% of American adults have ever used an online dating site, up slightly from 9% in early 2013. 9% of American adults have ever used a dating app on their cellphone. The share of Americans who use dating apps has increased threefold since early 2013 – at that point just 3% of Americans had used these apps. This growth has been especially pronounced for two groups who have historically not used online dating at particularly high levels – the youngest adults, as well as those in their late 50s and early 60s. For young adults in particular, this overall increase in online dating usage has been accompanied by a dramatic increase in the use of mobile dating apps. Fully 22% of 18- to 24-year-olds now report using mobile dating apps, a more than fourfold increase from the 5% who reported using dating apps in 2013. These young adults are now more likely than any other age group to use mobile dating apps. Although 15% of Americans have used online dating themselves, a larger share report that they are familiar with online dating from the experiences of people they know. Some 41% of American adults say they know someone who uses online dating, while 29% indicate they know someone who has married or entered into a long-term partnership with someone they met via online dating. As was the case in previous Pew Research Center surveys of online dating, college graduates and the relatively affluent are especially likely to know people who use online dating or to know people who have entered into a relationship that began online. Nearly six-in-ten college graduates (58%) know someone who uses online dating, and nearly half (46%) know someone who has entered into a marriage or long-term partnership with someone they met via online dating. By comparison, just 25% of those with a high school diploma or less know someone who uses online dating – and just 18% know someone who has entered into a long-term relationship with someone they met this way. 62% agree that online dating allows people to find a better match, because they can get to know a lot more people. 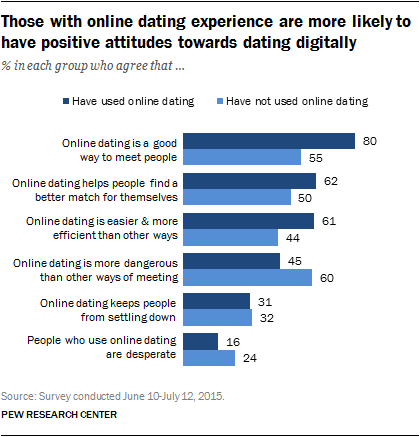 61% agree that online dating is easier and more efficient than other ways of meeting people. 31% agree that online dating keeps people from settling down, because they always have options for people to date. But despite these reservations, those who have personally used online dating themselves – or know someone who does – tend to have much more positive attitudes compared to those with little direct exposure to online dating or online daters. For instance, just 55% of non-users agree that online dating is a good way to meet people, while six-in-ten agree that online dating is more dangerous than other ways of meeting people. Overall, men and women who have used online dating tend to have similar views of the pros and cons – with one major exception relating to personal safety. Some 53% of women who have used online dating agree that it is more dangerous than other ways of meeting people, substantially higher than the 38% of male online daters who agree with this statement.